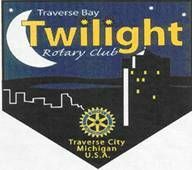 The members of the Rotary Club of Traverse Bay Twilight endeavour to be the premier service club, well known for what we do, in the Grand Traverse Region. Through the active participation of our members we will foster goodwill and better friendships by serving humanity at home and around the world. The members of the Rotary Club of Traverse Bay Twilight will provide service to our local and world communities thought active participation of all or our members. We will practice high ethical standards and adhere to the Four Way Test, while assisting our members in developing their leadership skills. 1. Increase Club's membership to 40 active members by June 30, 2019.
participation in the sustaining member program by 2019. 3. Continue to focus on literacy projects and high profile fund raising events to provide long term funding. 4. Be ready, willing and able to serve when called upon. 5. Develop and implement a new member orientation and and member education program. 6. Increase Club participation in Rotary International and District 6290 International Projects.